The original idea behind C.o.D. was unquestionable a product of Ingars' passion for sheer sonic brutality and devotion to the satanic ideology according to Anton LaVeys' Church Of Satan and the Satanic Bible. The contents of C.o.D. 's lyrics clearly reflect Ingars' beliefs as well as his deep admiration for vampirism. Next gig up! 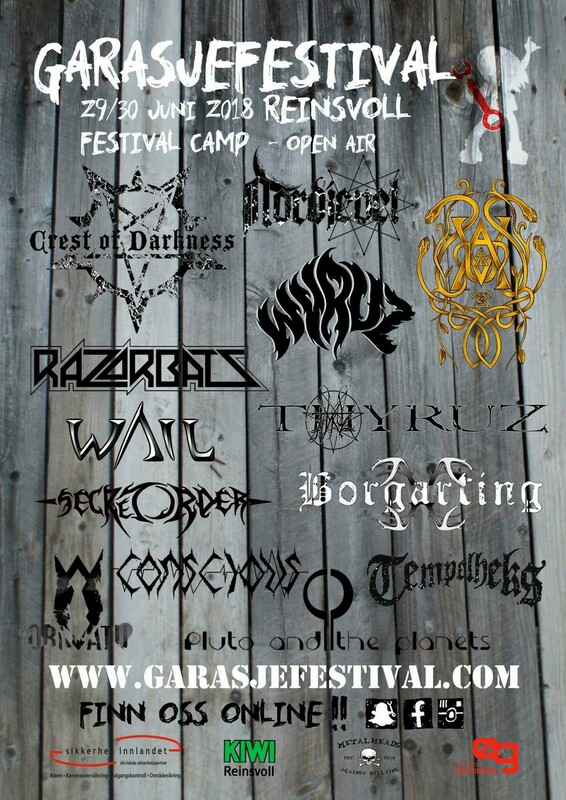 CREST OF DARKNESS is playing at GARASJEFESTIVAL on Saturday, June 30. 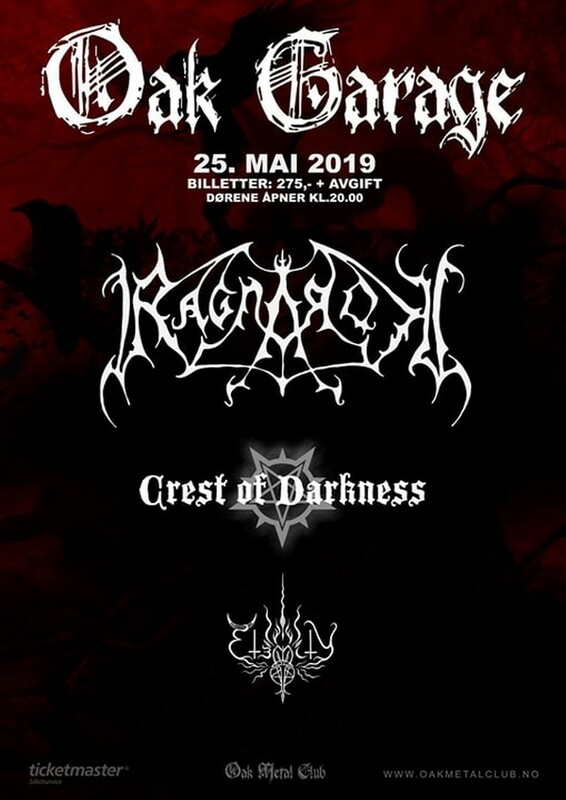 CREST OF DARKNESS is set to headline at ZONE METAL NIGHT LIVE on the 28th of April 2018 in Trondheim. 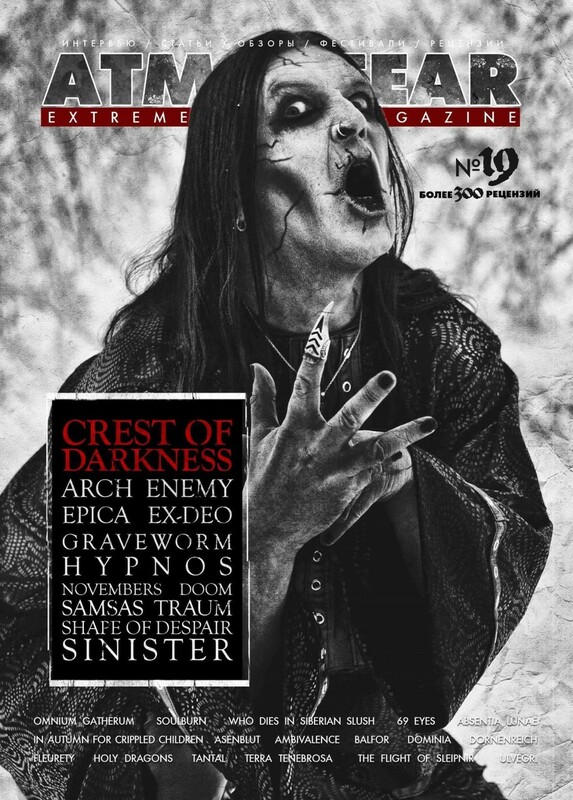 CREST OF DARKNESS on the cover of Issue 19 of ATMOSFEAR magazine! 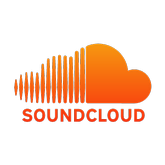 The issue uncludes an exlusive interview with Ingar Amlien. 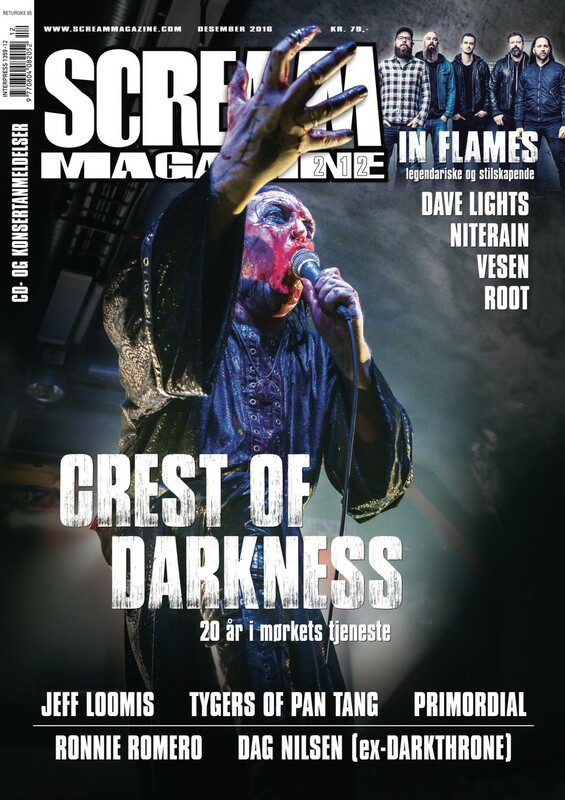 In the same number it's a big interview with Ingar Amlien, and on the top of it all Crest of Darkness' new album "Welcome The Dead" is "The Album of the Month"! WELCOME THE DEAD - New video !! Directed by Anders Børresen for MONITORmedia, the video for "Welcome the Dead" is a window into the soul of Crest of Darkness. Amidst the darkness that you'll find there you will also find the the age old quest for the meaning of life and death, and it is not a quest to which Crest of Drakness provides the answers, because they want you to find your own. In the words of Ingar Amlien "We are all Gods. each of us builds our own universe." 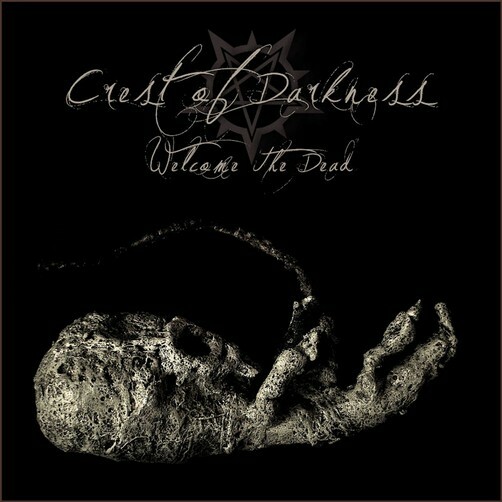 My Kingdom Music has revealed details of "Welcome the Dead", the ninth studioalbum from Norwegian Black Metallers CREST OF DARKNESS, which is set to hit the streets on the 2nd December in both CD and Digital formats, as well as a double LP format which will feature a special bonus track. 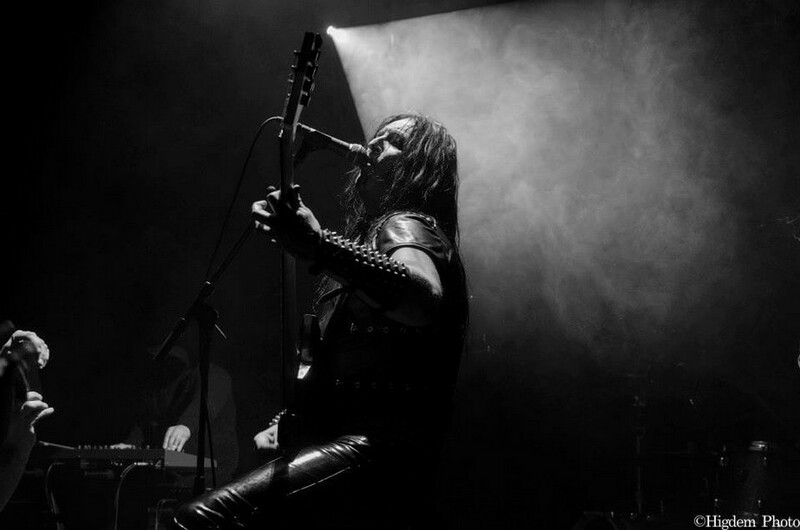 Recorded at the at MLP Studio by Nils H. Mæhlum and mastered at the Kvålsonic Lab by Tom Kvålsvoll, the nine-track album promises to be the heaviest, darkest and most introspective album in the band's twenty plus year history. 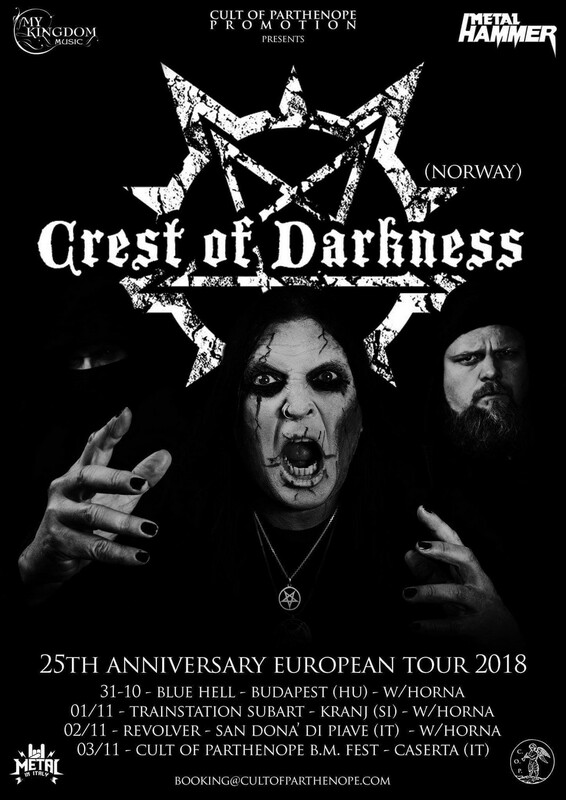 CREST OF DARKNESS' lineup, includes founder and frontman Ingar Amlien (ROQUEFIRE, CONCEPTION, AMLIEN's INFERNO) on bass and vocals, Rebo on guitars, Bernhard (ex- PALE FOREST) on drums, and Kristian Wentzel on keyboards. Earlier this year Amlien admitted that he sees "Welcome the Dead" as having a special significance for him personally: " I've put a hell of a lot of myself and my emotions into this album, even more so than usual. I've always felt that when we are on stage, we create a sort of magic, and this time we have been able to transfer that magic to the recordings. You could say this is my personal Black Mass". "We are absolutely delighted to be able to continue with, and build on, the strong relationship we have always had with CREST OF DARKNESS. We first started working together back in 2003, and we have watched the band develop its style and sound over the years, and we are very excited to be releasing their seventh full-length album towards the end of this year. We have no doubts whatsoever that the new album will push the borders of their take on extreme metal to new limits. 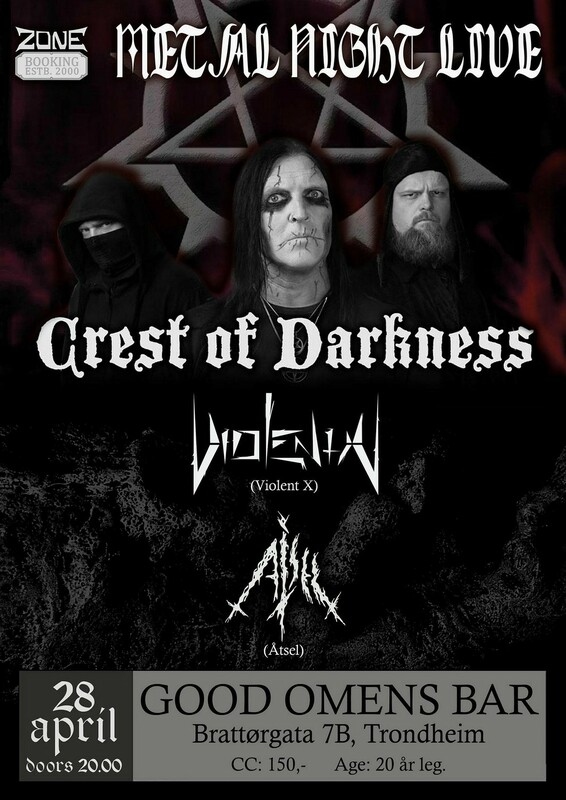 CREST OF DARKNESS' personal mix of Black, Thrash and Heavy Metal promises to make this the most mature and powerful album the band has ever released". Amlien himself gave some hints at what fans could expect from the album, as well as echoing the label's sentiments about their working relationship: " Over the years CREST OF DARKNESS and My Kingdom Music seem to have grown side by side, so I'm very happy to be able to continue working with a label that understands both our music and our vision, and with whom we have always been able to have an open and constructive dialogue. Particularly as the new album is especially important to me as I've put a hell of a lot of myself and my emotions into it. I've always felt that when we are on stage, we create a sort of magic, and this time we have been able to transfer that magic to the recordings. You could say this is my personal Black Mass. "We are not going to reveal too much about the album at this stage except to say that it is currently being recorded at the MLP Studio with Nils Harald Mæhlum at the helm. We worked with Mæhlum on our first albums, and we recently got together again when we recorded last year's "Evil Messiah" EP, and it felt natural so we decided to stick with him for the new album, and it's proven to be a very good decision".